When Carlos Ghosn pledged to bring a self-driving car to market in 2020, we thought Nissan's CEO was being a tad ambitious. Now he's clarifying exactly what the automaker is planning, and none of it will let you play Zombie Commando on your commute. Speaking at the Foreign Correspondents' Club of Japan this week, Ghosn broke down exactly what Nissan (and more likely, Infiniti) plans to roll out in the next six years under the Autonomous Drive brand. And as expected, it's more of an evolution of existing technologies than a Google-like autonomous pod panacea. "I want to clarify that there is a big difference between Autonomous Drive technology championed by Nissan, and self-driving cars," Ghosn said at the event. "Autonomous Drive is about relieving motorists of everyday tasks, particularly in congested or long-distance situations. The driver remains in control, at the wheel, of a car that is capable of doing more things automatically." To that end, in 2016 Nissan will bring an upgraded version of the low-speed traffic jam assist features available on Infinitis, along with a fully automated parking system that will be installed across a broad swath of its products. By 2018, the automaker will roll out a system that can automatically change lanes and juke around hazards in the road, and by 2020, Nissan plans a system that can handle intersections on its own. Ghosn also said that Nissan plans to have "enhanced communications" – likely 3G or LTE-embedded data connections – on 1.5 million vehicles in the coming years, all of which will be connected to a cloud-based system to provide better application support and voice controls. But the more balanced message from Ghosn was clear: we're not going fully autonomous, we're taking steps. Parroting what BMW, GM, Ford, Mercedes-Benz, and Volkswagen/Audi have said in the past year. "Self-driving cars, remain a long-way from commercial reality." 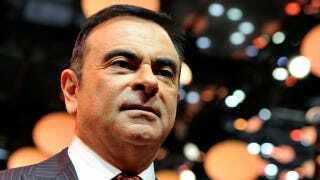 Ghosn said. "They are suitable only for tightly-controlled road-environments, at slow speeds, and face a regulatory minefield."